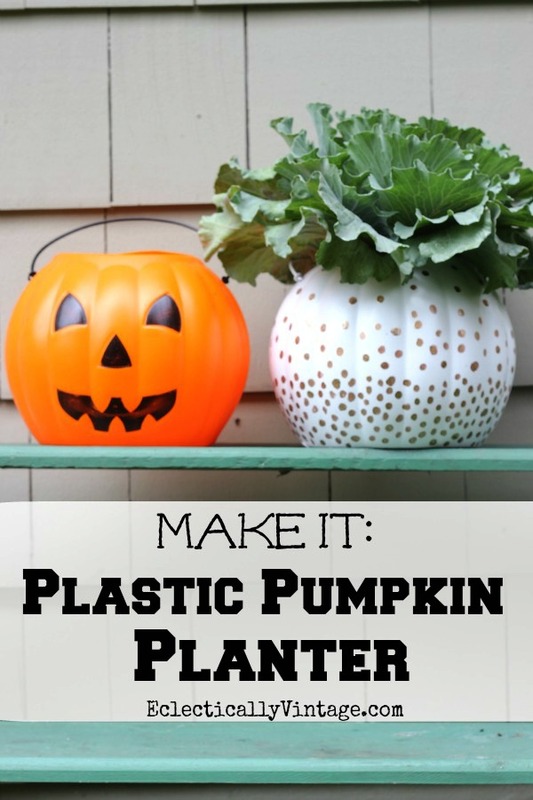 No More Ugly Plastic Pumpkins! 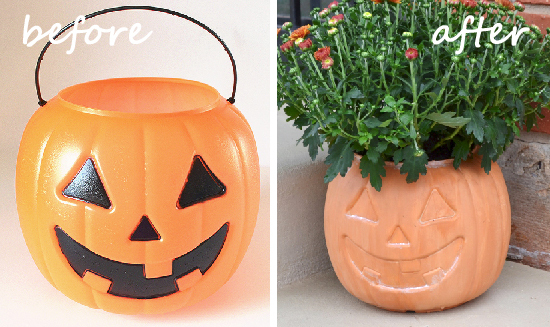 I’m on a personal mission to rid the world of ugly plastic pumpkin pails! It all started years ago when I couldn’t take the smug look on that ugly plastic pumpkin’s face anymore so I covered that hideous pumpkin in music sheets. The following year, I unleashed my fury on the ugly plastic pumpkin by blinging it out. I’m not alone in my deep hatred towards these lowly little plastic pumpkins. See how these gals have taken their aggressions out on their pumpkins. 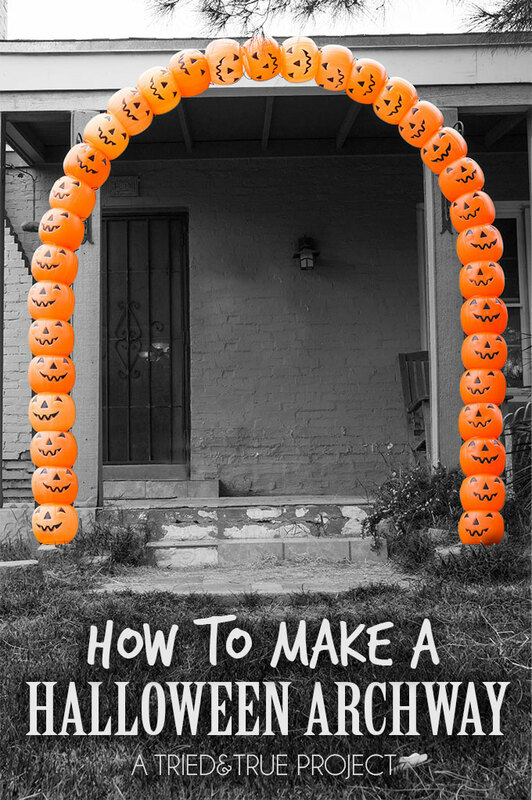 Tried and True decided to impale her pumpkins right through their heads when making a Plastic Pumpkin Archway. 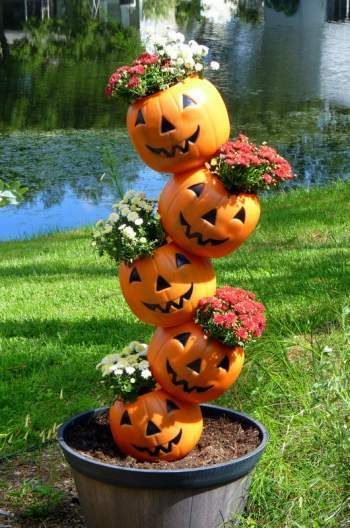 It’s easy to go from ugly to cute just by creating a topsy turvy pumpkin planter from Birds and Blooms! If you hate them then you better put a candle in them and turn them into pumpkin lanterns lining a walkway from Making Lemonade. You’d never know this folk art cat from Rook No. 17 started out life as a cheap plastic pumpkin! 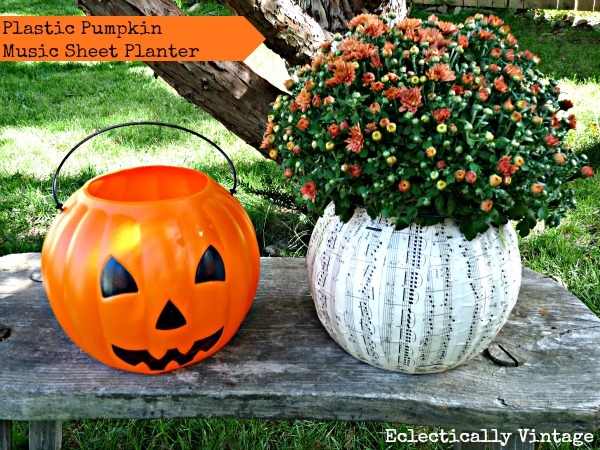 Dream a Little Bigger tricks everyone into thinking this plastic pumpkin is a real terra cotta planter with just a little paint. 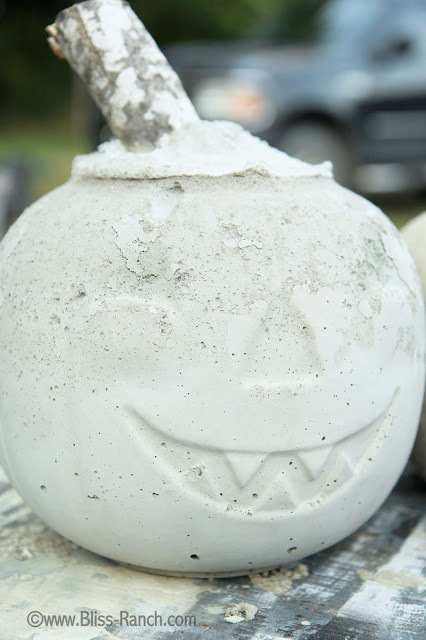 You could try using those ugly plastic pumpkins as forms for making concrete pumpkins like this beauty from Bliss Ranch. Whew, I feel so much better now that I’ve gotten that off of my chest. 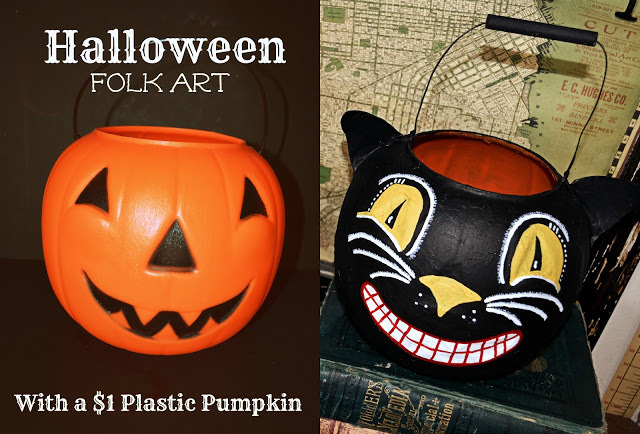 Won’t you help me spread my message far and wide – no more ugly plastic pumpkins! Make sure to check out more of my Halloween ideas. Duh! Don’t know why I never thought of using them as a mold to make concrete pumpkins! Great collection of not ugly pumpkins! oh come on now, don’t like candy either! I love the concrete pumpkin! Oh my gosh! Great ideas. Let’s hope the makers of said ugly plastic pumpkins don’t catch on or they’ll become expensive ugly plastic pumpkins! 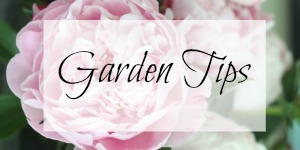 My favorite is the topsys planter but they are all great uses! Hm, might have to go buy me some! The arch way…..now that’s a lot of Happy Meals. I don’t know if they offer those anymore. But my pre-school kids just loved them when we had a special day. A little hard getting 40 some of those ugly things in a car. Great ideas. Hahaha! I’m so glad you took on this ‘advocacy’ Kelly! I’m with you on this all the way! 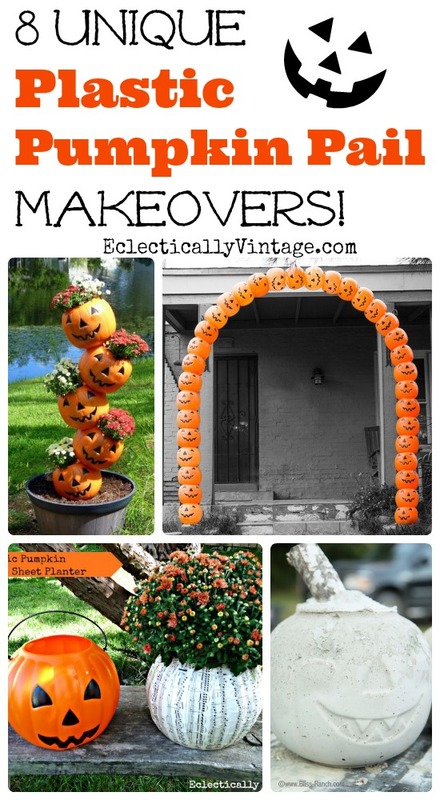 Great ideas, especially the arch way! I actually love those ugly plastic pumpkins. Before you deface one make sure it’s a cheap reproduction and not a vintage gem. 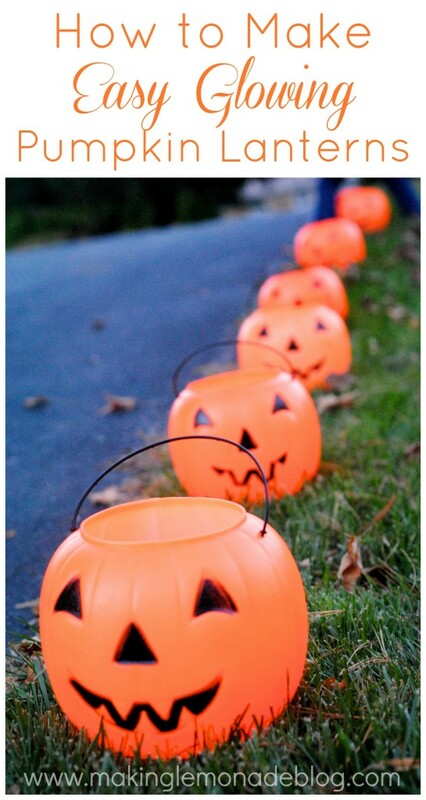 The vintage pumpkin pails tend to have thicker, flat handles. Hmmm….just saw this, only four years late saying thanks for featuring my concrete pumpkin. 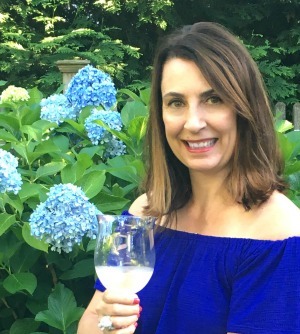 LOL – better late then never!